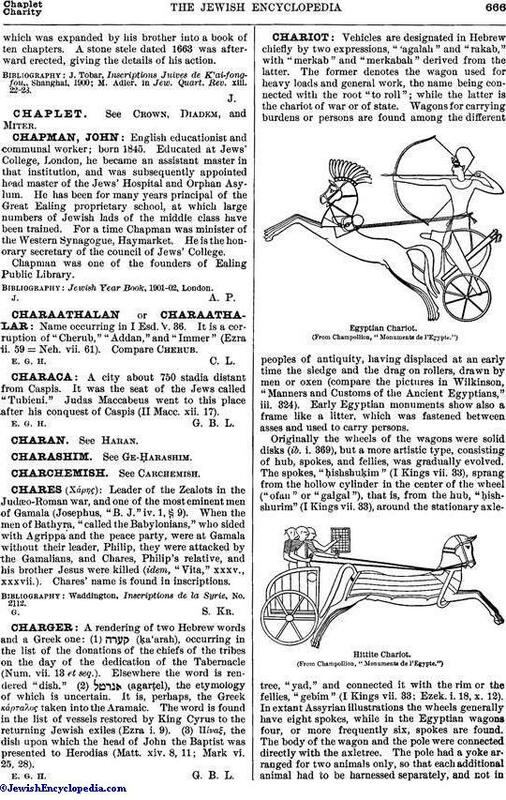 A rendering of two Hebrew words and a Greek one: (1) (ḳa'arah), occurring in the list of the donations of the chiefs of the tribes on the day of the dedication of the Tabernacle (Num. vii. 13 et seq.). Elsewhere the word is rendered "dish." (2) (agarṭel), the etymology of which is uncertain. It is, perhaps, the Greek κάρταλος taken into the Aramaic. The word is found in the list of vessels restored by King Cyrus to the returning Jewish exiles (Ezra i. 9). (3) IIίναξ, the dish upon which the head of John the Baptist was presented to Herodias (Matt. xiv. 8, 11; Mark vi. 25, 28).